Wonderful discovery. Warm and personable service, simple but cosy and the cook comes out occasionally to serve the food, it almost feels like eating in her home. Highly recommend. Meal correct overall; a bit expensive for what you could similarly get in similar restaurants in Geneva, but worths a try.. Service a bit slow though, and not very proactive! Thank you for an excellent evening! Looking forward to my next visit ! We are fast becoming regulars at the Saigon Pearl, as it is a rare gem of authentic Vietnamese cuisine in a cozy and romantic atmosphere, with friendly and attentive service! A family run restaurant, each dish is made fresh with care and attention. In Geneva there are few alternatives to typical Continental cuisine, so if you are missing a bit of spice in your life, SP is the place to go! Delighted we have found the restaurant. Returning soon. Real pleasure. Food is amazingly good.. service is great and very friendly. Saigon Pearl was a real gem of a discovery! 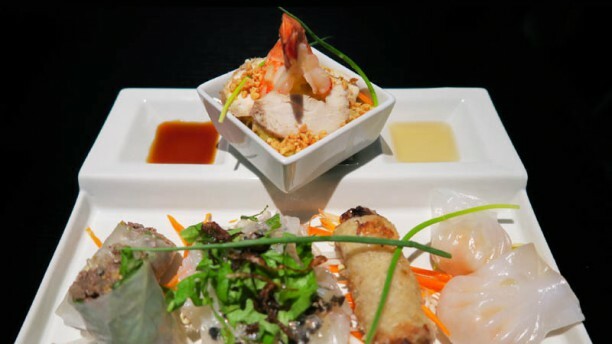 Delightful ambience, amazing, freshly made Vietnamese delicacies, all served with a smile and a flourish by the family that runs the restaurant. Accessibly priced too! Food was incredibly tasty as usual! The spring rolls for starters were good. I do find it pricey for 3 rolls of “nems” it’s 11 chfs. The brochette de bœuf was absolutely amazing and so was the gambas in coconut milk, I would absolutely recommend it. And for the desserts, the perle de coco were only 2 balls in a bowl and the banana roll were nice but again same as the entrees, quite pricey for what they are. The restaurant was nice, the ambience was pleasant and the staff were a delight. Thoroughly enjoyed the food...it was excellent. The hostess selected for us one of the dishes of caramelised beef -which was a one-off prepared for the special occasion of the Vietnamese new year- and it was delicious. The food quality was simply stupendous. Will definitely go again. The "marmites" are excellent and so are all the rolls. The Pho soup was a huge serving but a little disappointing.